Easy to use, as the marketing says, just connect and forget. Thanks for excellent service. Charger worked well. My mobility battery charger was delivered really quickly. its a great product and a brand name you can trust and have confidence in. I needed one urgently as a replacement for the original charger which suddenly died after not having it long at all. I am sure this NUMAX will serve me well.No problems with it at all. TANYA have been really good. I was sent the wrong charger. Although I returned the charger ten days ago, I still have not received the correct charger. Good advice and unit is very good. Speedy delivery, quality product, good technical support, would recommend. 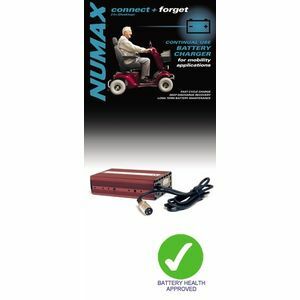 a excellent charger for my dad who is in his 80s so simple to use.plus a very good service from taynabatteries. Your service was absolutely brilliant, fast, accurate and friendly, all one could wish for.